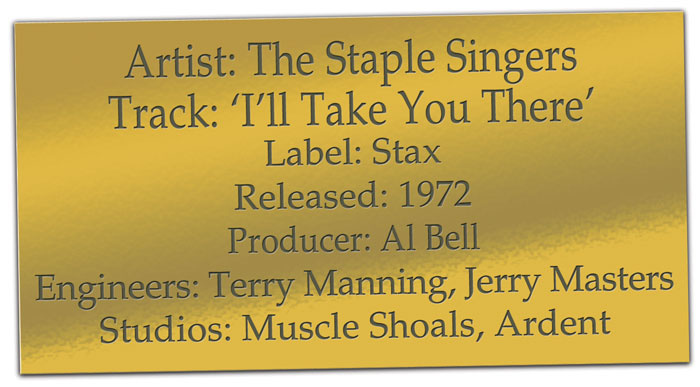 For the Staple Singers' landmark 1972 album, Terry Manning and producer Al Bell employed the talents of Memphis's finest musicians and two of the South's most famous studios. "I really think it's an art form to use production in a way that ends up pleasing the listener," says Terry Manning, whose credits as a producer and/or engineer include ZZ Top, Led Zeppelin, Isaac Hayes, Albert King, George Thorogood, Joe Cocker, Joe Walsh, Johnny Winter, the Fabulous Thunderbirds, Al Green, Elton John, Shakira, Lenny Kravitz and, most pertinent to this article, the Staple Singers. "Although I hear everything I have ever worked on critically, and there's always the element of looking back and saying 'Why didn't I do that instead?' I can now enjoy some of those things and actually sit back and just let them go." Manning was still a high-school freshman in El Paso, Texas, when he began playing guitar and befriended a local attraction named Bobby Fuller — in 1966, Fuller would enjoy brief fame with 'I Fought The Law' before dying in mysterious circumstances. Manning played several gigs with Fuller, who had his own nightclub, record label and two-track home studio, but then relocated to Memphis, Tennessee, when his minister father was assigned a church there in 1963. Since many of the 15-year-old's favourite recordings, by the likes of Rufus Thomas and the Mar-Keys, hailed from that city, he was more than happy to go there, and no sooner had he arrived than he went to Stax Records and snagged a job copying tapes and sweeping floors. At the same time, Manning also befriended John Fry, another go-getting high-school sophomore, who ran his own Ardent Records label and whose home studio would soon evolve into one of Memphis's top facilities. 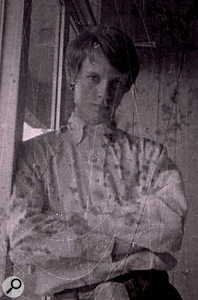 Not long after Fry cleaned up some demos by a band called Lawson and Four More, of which Terry Manning was a member, the two youngsters began working together alongside future producer Jim Dickinson, and it was the simultaneous employment by Stax and Ardent that provided Manning with his training as an engineer. "Neither studio had a problem with this arrangement," he says. "In the musical sense, Memphis was fairly isolated — it wasn't associated too much with Philadelphia, Chicago, New York or Los Angeles. Its music style was home-grown, even though technically we were trying to try to emulate the big boys in London, New York and Los Angeles. Musically, Stax was doing what it liked, and together with Ardent we were just one big happy family of people wanting to do music." 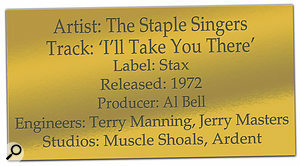 It was in 1971, after having engineered on albums by Isaac Hayes, Albert King, Led Zeppelin and Billy Eckstine, that Terry Manning first assumed the same role for the Staple Singers, pushing the faders in addition to playing guitar, harmonica, melodica and echo harp on their Staple Swingers album. This record, the first to be produced by Al Bell and tracked in Muscle Shoals, saw the Staples moving into funk, having started off as a traditional gospel quartet. 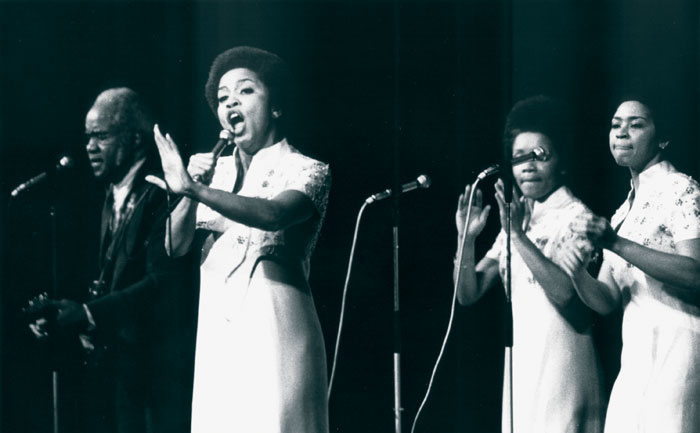 Roebuck 'Pops' Staples and daughter Mavis shared lead vocals, backed up initially by Mavis's sister Cleotha and brother Pervis. After flirting with white folk music during the mid-'60s, the Staples had signed with Stax in 1968 and brought themselves up to date by way of 'message' songs on their first two albums for the label, both produced by Steve Cropper. Then, after Pervis was replaced by sister Yvonne, Al Bell took over the production reins and funked things up, and the result was the Staples' halcyon period. This peaked with their fourth Stax album, Be Altitude: Respect Yourself, containing the Luther Ingram/Sir Mack Rice-composed hit 'Respect Yourself', as well as the soul-and-reggae-flavoured number one smash, 'I'll Take You There', written by Bell on Mavis Staples's living-room floor with some uncredited input from her. "Al Bell was a terrific arranger," asserts Terry Manning. "He was not a musician — he couldn't sit down at a piano and start playing a song and know which chord was which. If he did, it was quite rudimentary, but he really had an ear. He knew what was commercial, he knew what he liked, he knew what sounded good, and he was really interested in mixing musical styles. So, when we hooked up, we did many projects together and he came to rely on me quite heavily from a partial production standpoint, and certainly from a musician's standpoint, and totally from an engineering standpoint. And I would rely on him for his incredible intellect and knowledge of musical styles and feels and how things could meld together. Again, he was someone I learned so much from and to whom I'm so appreciative. "Al really liked the fact that, in addition to me living in Memphis and knowing the so-called 'Memphis Sound', I also came from a rock standpoint. I was completely into the 'British Invasion' led by the Beatles and the other great groups of the era — in fact, I was possibly into that type of music even more than the music I was working on at the time. So, in his eyes, I would bring a different viewpoint, a more rock & roll viewpoint, to R&B. He would branch out and look at places like Jamaica for the beginnings of ska and reggae music — they would be on other beats than the two and the four; they might be on the one and the three — and he would try to bring those things into the music. "We were actually trying to consciously meld things together, to do something different and bring a breath of fresh air to the way we were doing R&B, and I think that really culminated on the Be Altitude album where I overdubbed guitars that were heavily distorted and used Moog synthesizers. Those things just weren't being done at the time in R&B. On 'I'll Take You There', especially, we were really trying to get that jumpy Jamaican, early reggae feel, and it's kinda funny because among my good friends now are those two great Jamaican players and producers, Sly & Robbie. I told them 'Hey, you know, we were trying to copy you guys with "I'll Take You There",' and they said 'Really? We got "I'll Take You There" and we were trying to copy that on some record we were doing!'" 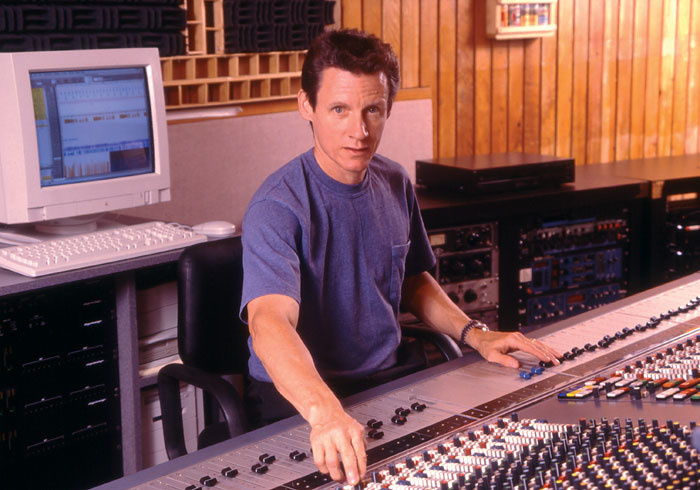 Manning, meanwhile, fulfilled more of a co-production role for many of the Be Altitude sessions, leaving the tracking to engineer Jerry Masters at the Muscle Shoals Sound Studio in Alabama where the rhythm tracks and guide vocals were recorded. "I gave advice on certain things, both technically and musically, and I also played some guitar, but basically I stayed out of the picture while Jerry did his thing," Manning says. "The Muscle Shoals studio was like a factory at that time, and it had incredible players: Roger Hawkins on drums, David Hood on bass, Barry Beckett on keys, and Jimmy Johnson on guitar. Mavis was the only member of the Staples to attend those initial sessions, laying down guide vocals surrounded by windowed baffles that allowed her to see the other musicians. You see, the Muscle Shoals guys had their own thing going really well, so there was no point for anybody coming in there — even if it was an Aretha Franklin or Rolling Stones session — to impose on them and say 'Hey, here's how I want it recorded!' You went there for what they did, and that's why we went there. As great as they were, Al wanted to get away from the Stax players, and that's because we were looking for a different feel and different types of things going on." Once Ardent Studios had moved out of John Fry's home into a rental space on National Street, Memphis, it virtually became the 'B' studio for Stax Records and artists such as Isaac Hayes, Booker T & the MGs and the Staple Singers, in addition to others like James Taylor and Ike & Tina Turner. Photo: Terry Manning"One reason they recorded at Ardent was because it was by far the most technically advanced studio in the area," Terry Manning explains. "We had the first four-track recorders, the first 16-track recorders, the first 24-track recorders, the first of everything. We would jump ahead of the technology and stay at the level of what the biggest studios were doing in other cities. What's more, there was an incredible musician base in Memphis: Isaac Hayes, Booker T, Steve Cropper, Teenie Hodges, the Memphis Horns. People wanted that sound, and when they also wanted the best technology we got those gigs. Well, that gave me quite a grounding early on when it came to working with all styles of music, while also dealing with plenty of local jingle work taught me to do it fast. "It was a training that has served me well through all the years that I've done this, and I always like to give the real credit to the musicians and the singers, because if you don't have something good to record, there's no point in recording. We were so lucky at that time to have absolutely incredible talent around us, whether it was Otis Redding, Isaac Hayes, Booker T & the MGs or the Staple Singers. I mean, three of the first drummers I ever worked with were Al Jackson, Jr, the Stax session player; John Bonham; and Ronnie Tutt, who played for Elvis Presley. To me, getting drum sounds was easy... Little did I know that years and years and years would follow with rarely having that calibre of drummer available!" Having founded Muscle Shoals Sound Studios in 1969, and with the help of legendary producer/A&R man Jerry Wexler, the aforementioned white quartet of Hawkins, Hood, Becket and Johnson moved the studio into a former casket warehouse they called the Burlap Palace. And it was there, inside a basic control room with a 16-input Flickinger console and MCI JH16 tape machine, that Manning looked through the glass towards a wood-floored live area above a basement where the caskets used to be stored. "The fact that it wasn't solid provided the room with a little bit of a thump and a ring," he says. "Roger Hawkins's drums were inside a booth that they had just built at that time, and it was very tight in there, so we were really into close-miking drums and there were no room mics at all. The overheads back then would have been Neumann U87s, placed on either side of the cymbals; on the snare and toms there would have been dynamic mics, either Electrovoice RE15s or Shure 545Ss — the 545S looked like an early 57. An RE20 was on the bass drum, and there was a Neumann KM84 on the hi-hat. 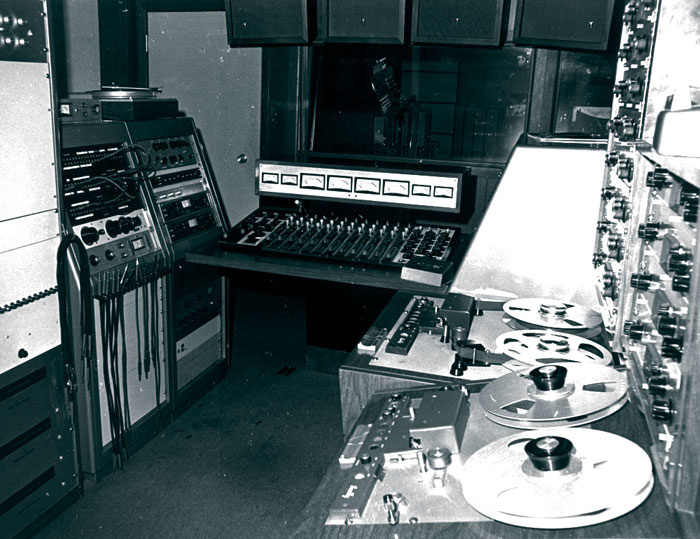 The control room at Ardent Studios, based around a Spectrasonics console and 3M tape machine.Photo: Terry Manning"Barry Beckett's electric piano was a Wurlitzer, and there was an RE15 actually miking the speaker, while David Hood's bass went through a passive direct box. Nothing fancy at all. Very rarely did we use an amp to record the bass. David's bass solo on 'I'll Take You There' was recorded live at Muscle Shoals; a great, great part. Eddie Hinton played guitar on the song, and he had a small Fender amp, miked with an 87 positioned directly on the 12-inch speaker, and there was also the guitarist Raymond Banks who came down from Stax — we'd joke because Raymond would play almost nothing. He'd be on the session playing just four or five notes, and we'd look over and say 'The guy's not playing.' Then we'd listen back to the song and go 'Wow, those were the notes to play.' He was the minimalist. It was all about feel. "Mavis, meanwhile, was also miked with an 87 — I tell you, we used those for everything — and she was just the incredible diplomat and party person. What a personality. She'd pal around with everybody and have so much fun, putting everyone at ease, that everyone wanted to play for her. In fact, on 'I'll Take You There' you can hear her talking to the musicians. In the middle part, she's actually calling their names out when they play different things — that's live from her guide vocal on the tracking sessions. She was so into it and had such a rapport with the musicians, and that's one of the things that made those sessions so great. There was a tremendous feel because everyone was really having fun." All of the rhythm tracks for the album were recorded at Muscle Shoals within four to five days, and consisted of complete takes without edits. Indeed, no more than five takes were required for each song, with the results successfully realising Al Bell and Terry Manning's aim of creating a sound that was, to their minds, distinct from that of Stax. "The Stax sound, as we perceived it back then, was pretty much straight ahead R&B," Manning explains. "It probably featured the greatest players to ever perform that style of music — Booker T & the MGs playing the rhythm, the Memphis Horns playing the horn parts — and it was wonderful and instantly recognisable. Well, Al and I maybe fooled ourselves a bit when we thought that the sound we created at Muscle Shoals was different — listening now, it's actually far more similar than it is different — but we wanted to go for more of an open sound, more of a rock sound, more of other ethnic musical sounds mixed in with the traditional 'Memphis Sound'. That's why we used the Muscle Shoals musicians, who were playing on records by Bob Seger and the Rolling Stones." 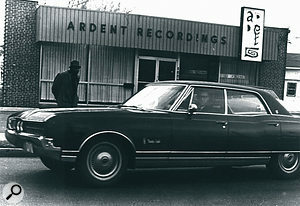 Once work had been completed at Muscle Shoals, the project reverted to Ardent, where Al Bell turned Terry Manning loose to add his contributions on guitar and keyboards. "Obviously, although none of my parts matched the virtuosity of people I respected and admired like Jimmy Page and Eric Clapton and Jeff Beck, I tried to capture their essence by using overdriven and distorted guitar effects, blending them with horns and generally trying to use a lot of production techniques in a more sophisticated way than just straight-ahead R&B." Terry Manning, in a photo taken on a miniature Minox 'spy camera' around 1972.Photo: William EgglestonAt Ardent, the control room housed a 16-input Spectrasonics console, a 3M M56 16-track tape machine and JBL monitors. "The Spectrasonics board had a really good sound," Manning says. "It was very direct and the sound of the mic pres and the signal path was really, really clean and excellent. 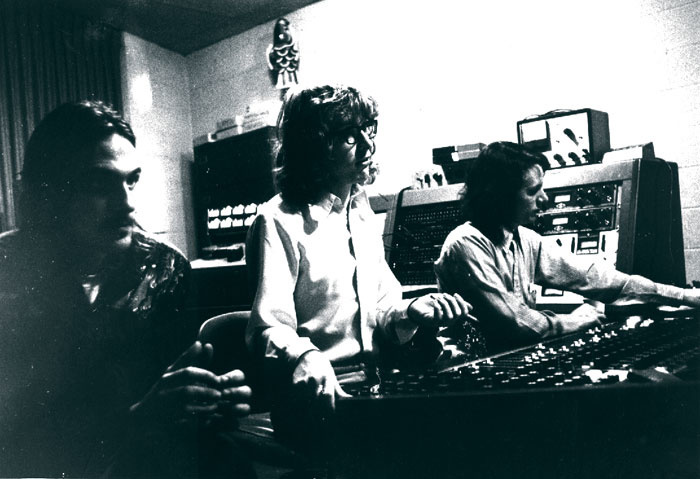 The tape machine was the second 3M 16 ever made — it was brought in for the mix of the Led Zeppelin III album — and we used it for many years. It was awesome. "The effects we had back then were quite simple, but the thing that I really liked and used on almost everything was a Universal Audio 176 limiter. This was the valve precursor to the 1176, and I still have one today and have created my own brand of tube limiters somewhat based on that. To me, Bill Putnam's 176 was one of the defining sounds of music — a great, great piece of equipment — so we used that and we also had outboard equalisers. We had some Pultecs, we had some Langevins, and I'd usually patch in one of those when we went to EQ as the Spectrasonics in-board EQ was good and usable but not terribly powerful. "In terms of delays, I would use the tape machine and either delay something once with that, use varispeed if I wanted to change the delay time, or bring it back into the mix for feedback, while for reverb I used an EMT 140 plate for virtually everything. Stax had echo chambers that were quite interesting-sounding — good for some things, not for others — but the EMT 140 was pristine, and I used that a lot." Once the sessions for the album had moved to Ardent, Mavis Staples laid down her lead vocal parts, Manning compiling a performance from three or four takes of each song. "People look back on those times and say 'Oh, it's classic, things weren't manipulated,' but I will admit I was certainly comping the vocals," Manning states. "The reason I didn't comp the rhythm track was because, not only were the musicians so good, but cutting two-inch tape also wasn't the most fun thing to do and you could easily hear a splice if you weren't very careful. Additionally, after you'd edited the multitrack, everything else you recorded was going over that splice. On the other hand, once we had a good, solid master take of the rhythm track, comping the vocals didn't require splicing with a razor blade. It was just a case of choosing the part and punching it in, dubbing it down. I didn't get microscopic and work on every syllable like people do today in the digital world, but if there was a better line or half-line from a different take I would certainly use that. "I recorded Mavis with an 87 going through the UA 176, standing out in the middle of the floor with some tall baffles behind her to minimise the big room a little bit. Since it wasn't a terribly live room, this worked quite well, and I actually interspersed the overdubbed vocals with bits of the guide track. Mavis was so spontaneous and she did so many things right off the cuff, it was hard to discard them, so some of that vocal on 'I'll Take You There' — as well as on the other songs — was taken from the guide track. "Once I had a comp of Mavis, she and the rest of the Staples recorded the response vocals, and we also doubled the harmonies to thicken the backing track underneath everything. For those harmonies, they would be grouped around one 87 — if it was a small enough group I would have it in cardioid and have them out in front, whereas on other occasions I would do a figure-eight and have them facing each other. They were so talented, I couldn't mess up. It was just a matter of getting a good level and not over-limiting." 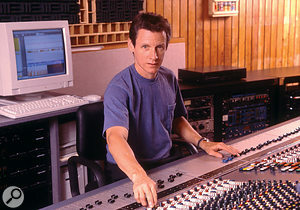 Terry Manning did not only engineer albums such as Be Altitude: he would also play numerous instrumental parts, most of them overdubbed onto the basic tracking sessions after the fact. "Al [Bell] would give me the general concept," Manning recalls. "He would say 'I really want something layered. I want something more. I don't want just three pieces. I want little things that come in and out. I want texture.' That's what he wanted on all of these songs; texture. He thought he was creating an R&B classic, and he was, so he was looking for textural things, and it was with these guidelines in mind that I'd experiment with different sounds. I was quite lucky to have a studio full of great equipment and great instruments, and to be left alone to use them. "So, I was just working, working, working on overdubs for any one song, and on 'I'll Take You There' we added four, five, maybe six instruments, often just mixed in for tiny little pieces that would pop in and pop back out. For example, I would sometimes use a very, very high, tinkly little Moog synthesizer sound, injecting it into certain places to try to mentally capture people. If young kids heard that, they might be attracted to it and get drawn into the rest of the song. And that's what we were trying to do: psychologically manipulate the listener with production techniques. That wasn't the overall thrust and concept at other R&B places like Stax back then, who were trying to capture the listener by way of incredible virtuosity and a strict groove and very simple production. "A song like 'I'll Take You There' has become so ingrained in the consciousness of those who have heard it, it's hard to now say which, if any, sounds shouldn't be there. Of course, some of the synthesizer sounds got so over-used later on that they started to sound somewhat trite and were passed over for other things, but at the time of the Be Altitude album they were brand-new and no one had done things this way before." "On 'I'll Take You There', after the vocals had been recorded, I remember playing quite a bit of guitar, some of it distorted, and adding my simulated version of lead towards the end of the song with a Fender Telecaster on which I had put a humbucking pickup. I miked that with a Shure SM57 and used an early Gibson Fuzz-Tone box, playing in the control room with a long speaker lead running out to a Fender Bassman amp... That's now a well known guitar because I later sold it to a guy named Michael Toles of the Bar-Kays and he used it on 'Shaft'. "I did a few little instrumental things, experimental things, and saved some of those for the very end, and then we brought in the Memphis Horns: specifically, Wayne Jackson and Andrew Love, the two guys who have always been in the group and copyrighted the name, as well as several other players. On that session we had two trumpets, two saxes, a baritone sax and a trombone as well. They were recorded in the main room at Ardent, again without much baffling, the trumpets miked together with a KM84, the saxes with an 87, the baritone with an 87 and the trombone with a KM86. "The Memphis Horns make up most of their own parts on the spur of the moment. That's their MO. They come in, they listen to a song, they quickly get a part in their heads — something that jumps at them, because they're so used to doing it — and they then build around that. They were doing that in the early days, too, unless they were working with Otis Redding, who would hum them the horn parts. However, on 'Respect Yourself' I did have a horn line in my mind, so I demoed the part with the Moog IIIC near the end, and I also played it on guitar in a spot or two, and then when the Horns came in I had them copy that line at the end. Later on, however, Al Bell said 'Look, I'm so used to hearing the synth, can't we keep it, too?' So, I had the synth starting the line and then the horns pick it up before I also pick it up on guitar later." As for 'I'll Take You There', a number largely built around just two chords, there were a few other additions on the part of Terry Manning: a harmonica and several guitar parts that he recorded late at night and then submitted to Al Bell the following day. "Doing things like that took time and took a lot of thinking, but I just loved the whole mix, with the great playing by the rhythm guys, the horns that were so cool, and all of the different types of sound blending together." Terry Manning mixed at Ardent using a Scully 280 quarter-inch machine, at a rate of about two songs a day. "A lot was left to the mix," he says. "I rarely mix as I go along. Every time I go to a mix, I turn my brain around in a completely different way and build the mix piece by piece, usually starting with the bass and drums, and then bringing things in gradually before I start soloing things." Terry Manning now runs the renowned Compass Point Studios in the Bahamas.Photo: Patrick CromwellIn total, the Be Altitude album took about six weeks to record, and it was a joyous experience for Terry Manning, who remained at Stax until its closure in 1975 and then spent the next 17 years dividing his time between London and Memphis, since when he has run Compass Point Studios in the Bahamas with his wife Sherrie. "I cannot stress enough how much fun it was to work with the Staples," he declares. "They just loved life, they had a great time, there was a lot of laughter and excitement during so many sessions, and while we knew it was a business and we were in there for a purpose, at that time we didn't think so much about budgets or about schedules. We just tried to do things as best as we could, the Staples came into the studio to enjoy themselves, and that made things so easy." Bell and Manning's attempts to get away from the 'Memphis Sound' initially met with mixed responses. When co-writer Sir Mack Rice (who also wrote 'Mustang Sally') first heard 'Respect Yourself', he said "You've ruined my song!" — but he revised this attitude after the recording hit the Top 20. "'Respect Yourself' prompted some funny reactions," recalls Terry Manning. "When 'Pops' Staples first heard the mix, he said, 'Oh, it's horrible. My voice is so low and the band is so high. All I'm hearing is music.' It was different to how people expected it to be. We've now grown used to it, and it does sound right... at least, I hope it does."